Background: Drug shortages and increasing generic drug prices are associated with low levels of competition. Mergers and acquisitions impact the level of competition. 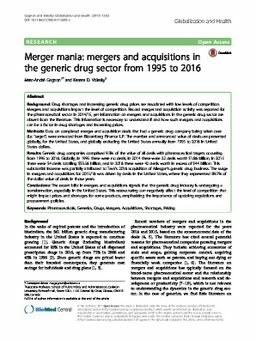 Record merger and acquisition activity was reported for the pharmaceutical sector in 2014/15, yet information on mergers and acquisitions in the generic drug sector are absent from the literature. This information is necessary to understand if and how such mergers and acquisitions can be a factor in drug shortages and increasing prices. Methods: Data on completed merger and acquisition deals that had a generic drug company being taken over (i.e. 'target') were extracted from Bloomberg Finance L.P. The number and announced value of deals are presented globally, for the United States, and globally excluding the United States annually from 1995 to 2016 in United States dollars. Results: Generic drug companies comprised 9.3% of the value of all deals with pharmaceutical targets occurring from 1995 to 2016. Globally, in 1995 there were no deals, in 2014 there were 22 deals worth $1.86 billion, in 2015 there were 34 deals totalling $33.56 billion, and in 2016 there were 42 deals worth in excess of $44 billion. This substantial increase was partially attributed to Teva's 2016 acquisition of Allergan's generic drug business. The surge in mergers and acquisitions for 2015/16 was driven by deals in the United States, where they represented 89.7% of the dollar value of deals in those years. Conclusions: The recent blitz in mergers and acquisitions signals that the generic drug industry is undergoing a transformation, especially in the United States. This restructuring can negatively affect the level of competition that might impact prices and shortages for some products, emphasizing the importance of updating regulations and procurement policies.